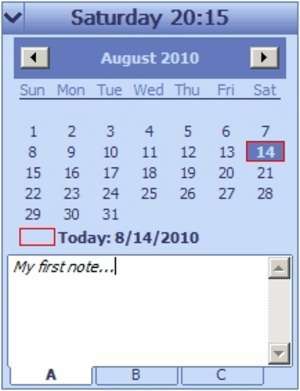 Desktop Calendar Reminder is simple, compact and easy to use desktop calendar. It has digital clock, calendar and note's area for every day. There are options for changing calendar colors, fonts, style, and more. It is the best desktop calendar. Desktop Calendar Reminder 1.70 is a shareware program and can be used as a demo to try the software until the free trial period has ended. A full version of the program is available after the trial period ends. For security reasons, you should also check out the Desktop Calendar Reminder download at LO4D.com which includes virus and malware tests. Additional screenshots of this application download may be available, too. 3.88 out of 5 based on 16 ratings. Desktop Calendar Reminder has a presence on social networks.